A baseline is a logical name that can be attached to a certain state of a branch of your project. Normal, the state of your project is identified by the timestamp of the run that computed the project state. A baseline is a convenient way to refer to such a state (instead of a date). A baseline can be used to compare the last run to (otherwise, the last run is compared to the run 30 days ago). A baseline can be used to mark a milestone in your development process. It is even possible to associate multiple consecutive runs with the same baseline. This makes it possible to schedule metric calculation over multiple points in time, while still making it appear as a single logical run in the viewer. By giving these consecutive runs the same baseline, the viewer will show a single measurement point (with the date of the first of these runs). 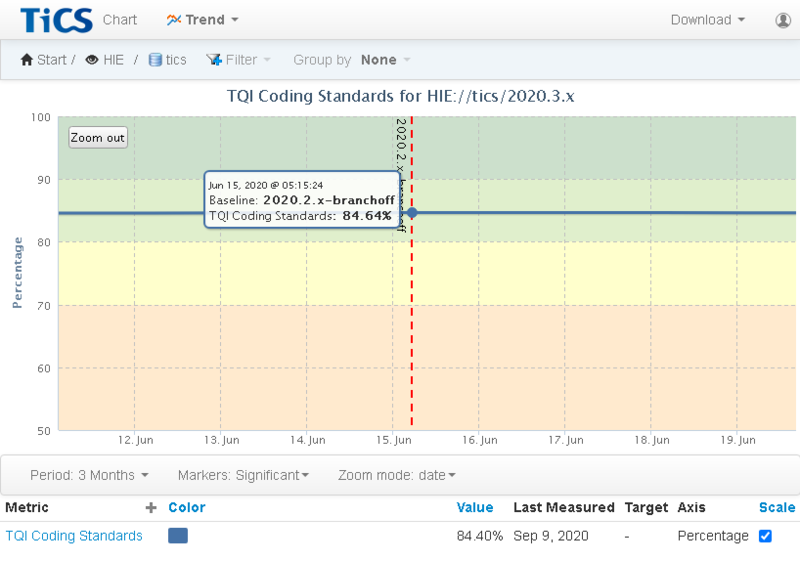 To set a baseline, see TICSMaintenance -setbaseline. It is also possible to automatically set a baseline after branch calculation: TICSQServer -setbaseline.